Rock falls are common in Yosemite Valley, California, posing substantial hazard and risk to the approximately four million annual visitors to Yosemite National Park. Rock falls in Yosemite Valley over the past few decades have damaged structures and caused injuries within developed regions located on or adjacent to talus slopes highlighting the need for additional investigations into rock-fall hazard and risk. This assessment builds upon previous investigations of rock-fall hazard and risk in Yosemite Valley and focuses on hazard and risk to structures posed by relatively frequent fragmental-type rock falls as large as approximately 100,000 cubic meters in volume. 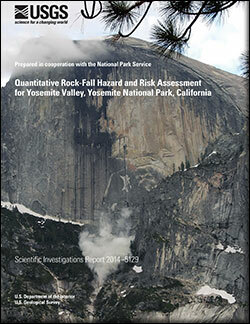 Stock, G.M., Luco, Nicolas, Collins, B.D., Harp, E.L., Reichenbach, Paola, and Frankel, K.L., 2014, Quantitative rock-fall hazard and risk assessment for Yosemite Valley, Yosemite National Park, California: U.S. Geological Survey Scientific Investigations Report 2014–5129, 52 p., http://dx.doi.org/10.3133/sir20145129.